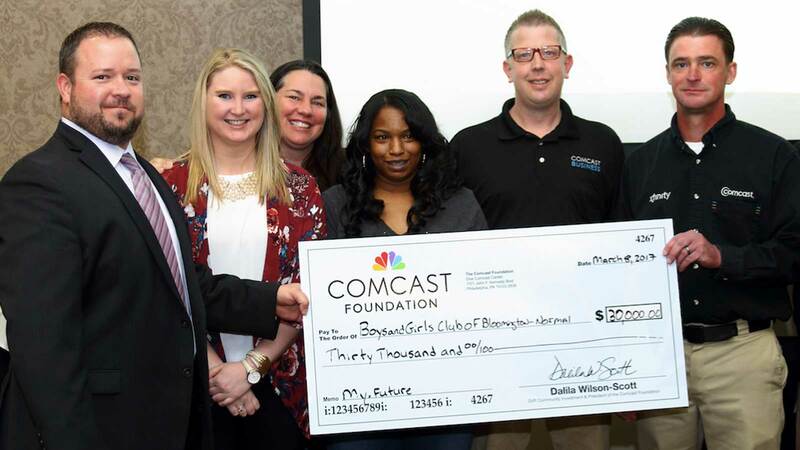 Boys & Girls Club of Bloomington-Normal announced today that it received a $30,000 grant from the Comcast Foundation to help expand the My.Future technology initiative, which uses hands-on technology training designed to equip Club kids with the skills needed to compete in a 21st century economy. Comcast announced that the grant will provide Club staff with training and funding to purchase state-of-the-art equipment including laptops, tablets, music studio tools and video-editing technology needed for the Clubs to fully implement and teach the My.Future curriculum. My.Future is a cutting-edge technology education initiative that provides hands-on experience and enables Boys & Girls Club of Bloomington-Normal members to select from more than 40 activities to help them understand how to safely and productively engage online, and identify and develop digital interests – from Internet basics for technology beginners, to robotics, coding, game design and online journalism for advanced learners. In 2015, the Comcast Foundation invested more than $3 million in Boys and Girls Clubs of America’s (BGCA) My.Future technology initiative. BGCA is using $1.5 million to further develop and build-out the My.Future program. The remaining funding is being awarded to approximately 90 local Boys & Girls Clubs across the country, including Boys & Girls Club of Bloomington-Normal to ensure they have access to the technology, tools and teachers to fully activate the program. The grant is part of Comcast NBCUniversal’s five-year partnership with Boys and Girls Clubs of America (BGCA). Since 2011, Comcast and the Comcast Foundation have dedicated more than $240 million in cash and in-kind support to fund digital readiness initiatives nationwide, reaching nearly 3.2 million people through non-profit, digital literacy partners, including Boys & Girls Clubs of America. Comcast has supported local Boys & Girls Clubs for more than a decade, providing more than $100 million in cash and in-kind contributions. Boys & Girls Club provides a safe after-school environment for hundreds of kids on Bloomington’s Westside. 94% of Boys & Girls Clubs members receive free or reduced lunch at school and 75% are from single-parent households. The Club serves more than 800 youth annually, with 609 registered Club members and 208 youth served through community outreach. The annual membership fee is $25 per child. Dues are low so no child is turned away, although it costs the Club more than $500 per member per year to keep the Club open. Comcast Corporation (Nasdaq: CMCSA, CMCSK) is a global media and technology company with two primary businesses, Comcast Cable and NBCUniversal. Comcast Cable is one of the nation’s largest video, high-speed Internet and phone providers to residential customers under the XFINITY brand and also provides these services to businesses. NBCUniversal operates news, entertainment and sports cable networks, the NBC and Telemundo broadcast networks, television production operations, television station groups, Universal Pictures and Universal Parks and Resorts. Visit www.comcastcorporation.com for more information. The Comcast Foundation was founded by Comcast Corporation in June 1999 to provide charitable support to qualified non-profit organizations. The Foundation primarily invests in programs intended to have a positive, sustainable impact on their communities. The Foundation has three community investment priorities—promoting service, expanding digital literacy, and building tomorrow’s leaders. Since its inception, the Comcast Foundation has donated more than $195 million to organizations in the communities nationwide that Comcast serves. More information about the Foundation and its programs is available at www.comcast.com/community.